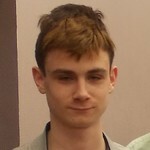 "I am 15 years old and have been playing bridge for the past 2 years. I come from a bridge playing family. My Dad, Harry, taught both me and my brother, Sam, to play and is also teaching my younger sister, Venetia to play. I recently won the Under 21 Pairs at the Easter Congress with my brother Sam. When I'm not playing bridge I enjoy spending time outdoors in the beautiful Devon countryside." Theo also won the Swiss Teams competition at the 2017 Riveria Congress, teaming up with brother Sam and parents Sally & Harry to take the title.